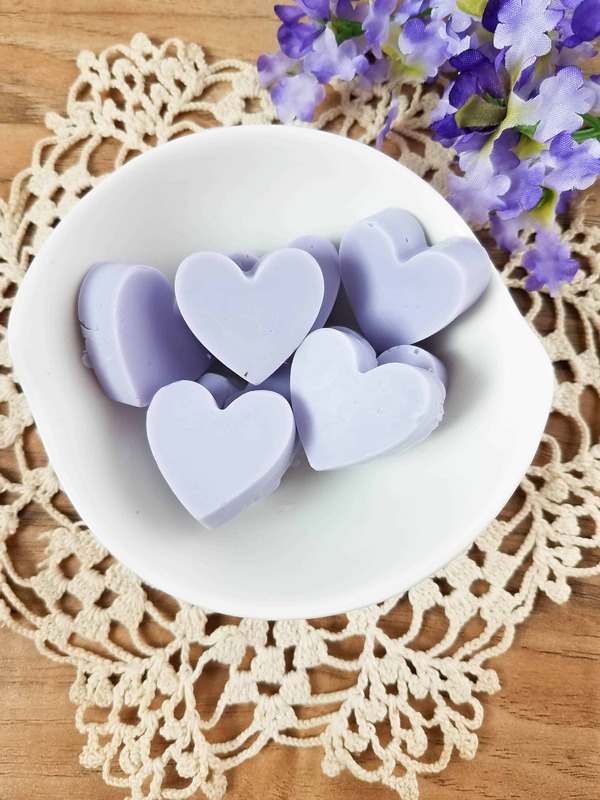 This Lavender Soap Recipe is super simple to make yourself, at home. 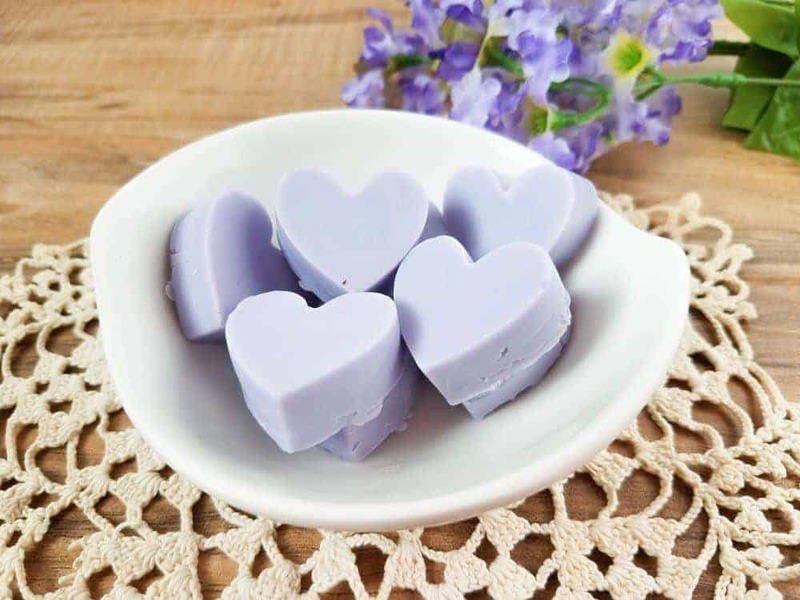 These cute heart shaped Lavender Scented Soaps will look great sitting in a soap dish in your bathroom. 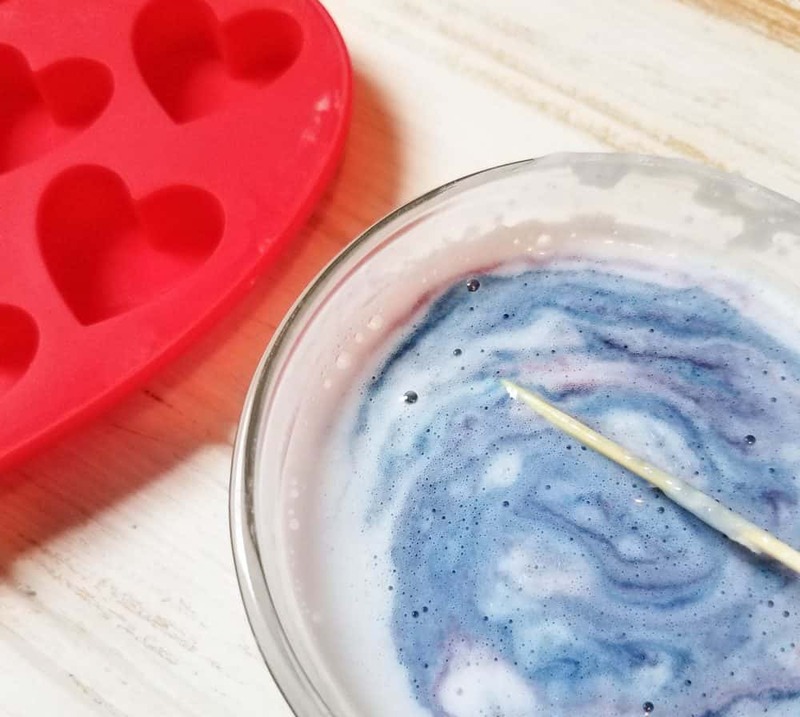 They also make a great DIY Gift Idea for Valentine’s Day, Mother’s Day, Christmas, birthdays or any days! I used to think that making my own health and beauty products would be so difficult and overwhelming, but I was so wrong. With just a few of the right ingredients, you can whip up a quick batch and have them ready to go whenever you need them. 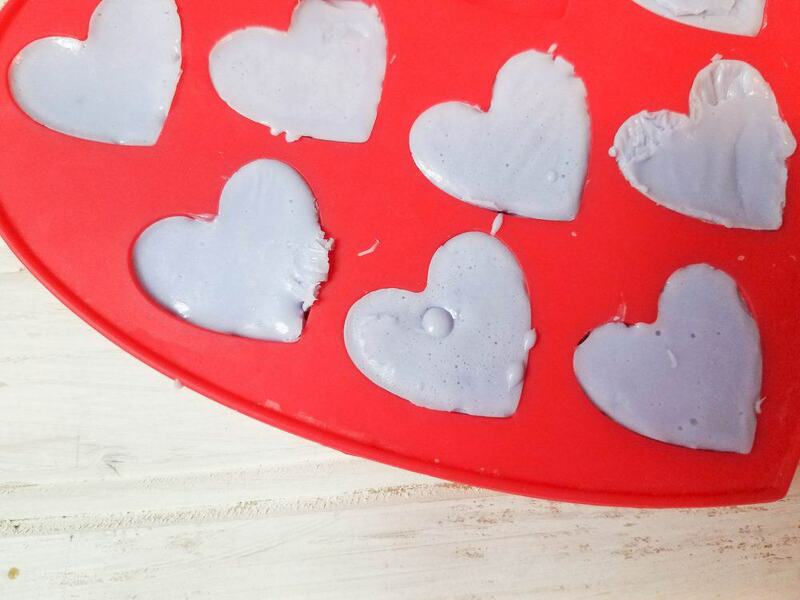 *Saving Dollars and Sense Tip: You can use any silicone molds like these ones from Amazon. There are SO Many different shapes available. 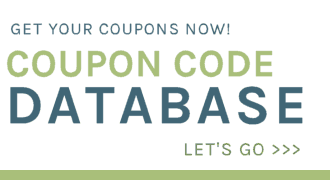 It is not that hard to make your own homemade bar soap if you have the right ingredients and follow the step below. Step 1. Put soap base in glass bowl and microwave for 30 seconds. Stir very well. If not completely melted, put on for another 10 seconds. Step 2. Stir liquid soap dye and essential oil into the bowl. 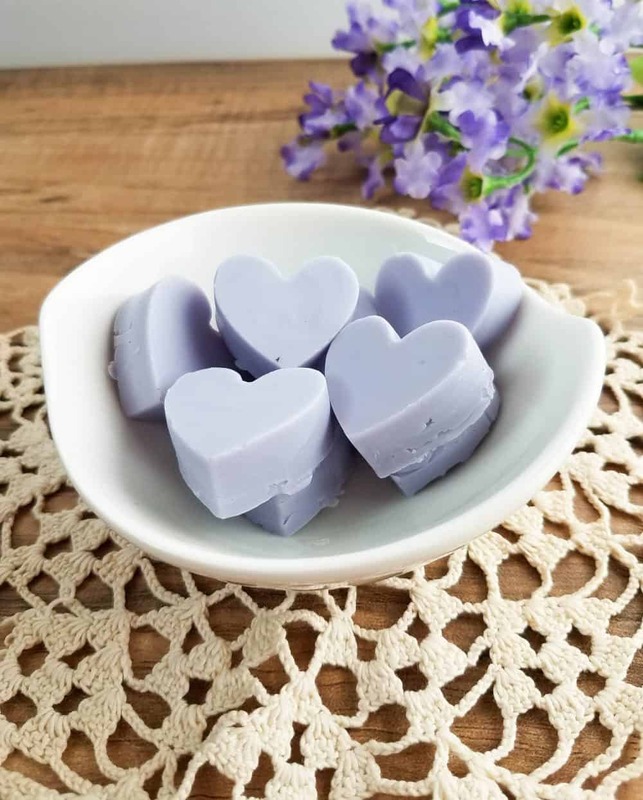 We are using lavender essential oil for this recipe, but you can use any essential oils that you would like to change the way that the soap smells. I love using lavender essential oil because it works really great to make your skin feel its very best. Each essential oil that you choose has different benefits, so you can use this recipe to make all kinds of different ones. I really love Peace & Calming or Stress Away for evening bath time. Step 3. Spoon mixture into the silicone mold. Step 4. Let set for about 30 minutes and remove from mold. Keep these in a cool dry place until you are ready to use them or put them into a nice clear plastic gift bag and tie with some ribbon to give away as a gift. What is Lavender Soap Good For? Lavender essential oil has a scent that’s a wonderful blend of fresh, floral, clean, and calm. It’s this dynamic aroma that has made the plant a classic for perfumes, soaps, fresheners, and beauty products. Lavender is a great beginner oil and a must for every home. Lavender essential oil isn’t just a favorite because of its classic scent—it’s also highly versatile. From skin care products to relaxing routines, this oil can infuse and enhance many areas of your life. Using this essential oil to make your lavender soap is a great choice!